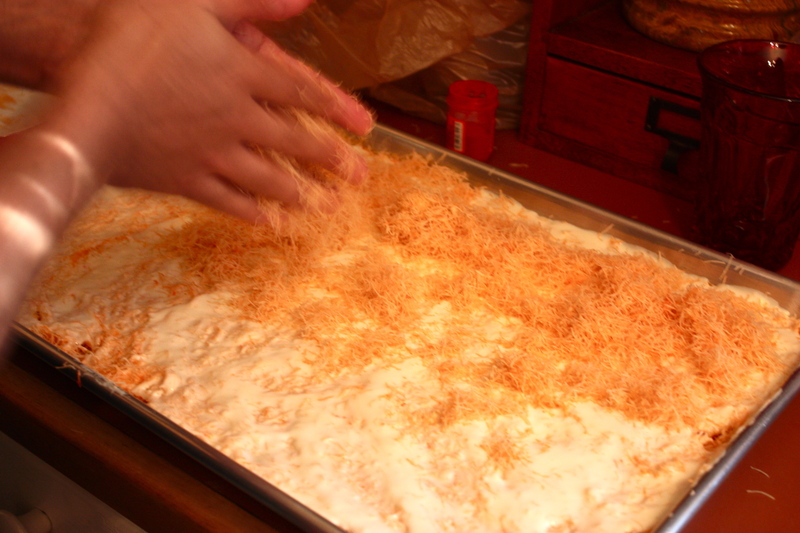 Konafa, an Arabic dessert | "Il faut goûter"
My experience with Konafa has gone something like this–I first tasted it at an international dinner at the university. One of my ESL students motioned me to his table and urged me take half of his little square of this curious dessert–it was sweet, buttery, simple…yet I wasn’t quite sure what composed it. It was also gone, empty–the entire dish of it on the dessert table was eaten at the beginning of dinner. 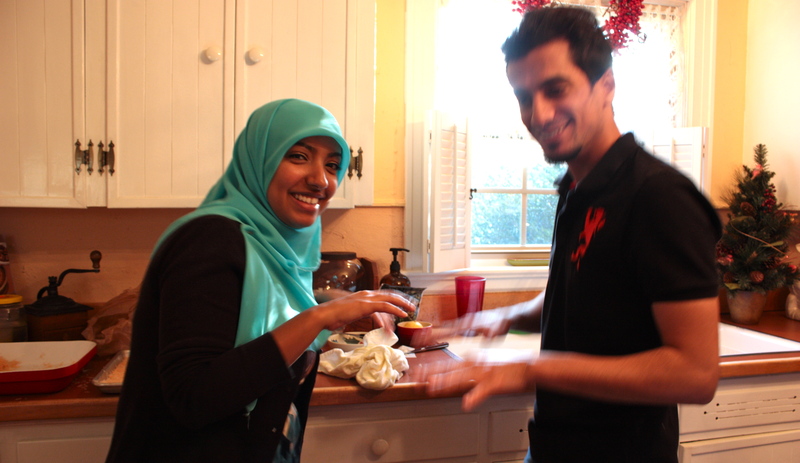 Abdulrahman (my student/friend) apparently knew how fast it would be devoured. A couple months later, the university hosted its annual international festival (WOW), the cafeteria full of international dishes to savor. That same Abdulrahman was serving food with the Saudi Club, and he had announced to me that they would be selling the famous Konafa. This time I would get my very own piece of that mysterious crunchy, custardy delight! 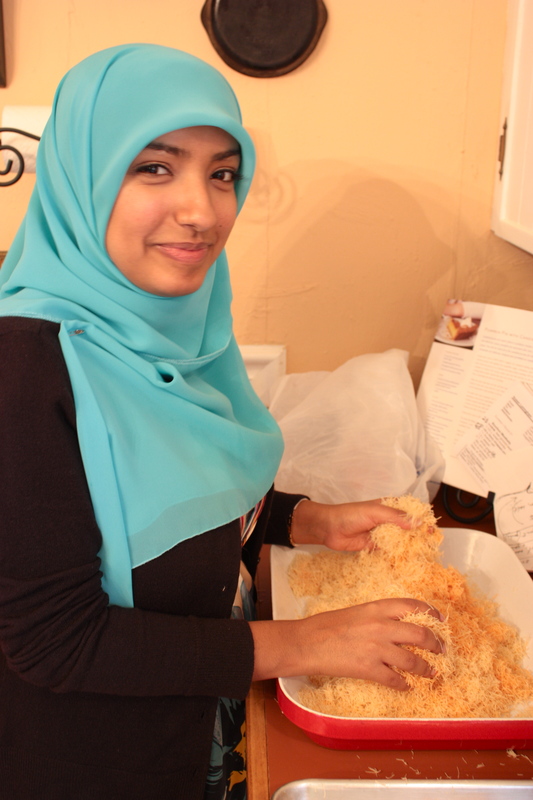 Before this dinner party, Thana said she would bring the ingredients for Konafa and make it there, before my very eyes. Finally! I would really get to eat it! And what’s more, I would finally know what went into creating that curious crunchy/creamy texture! 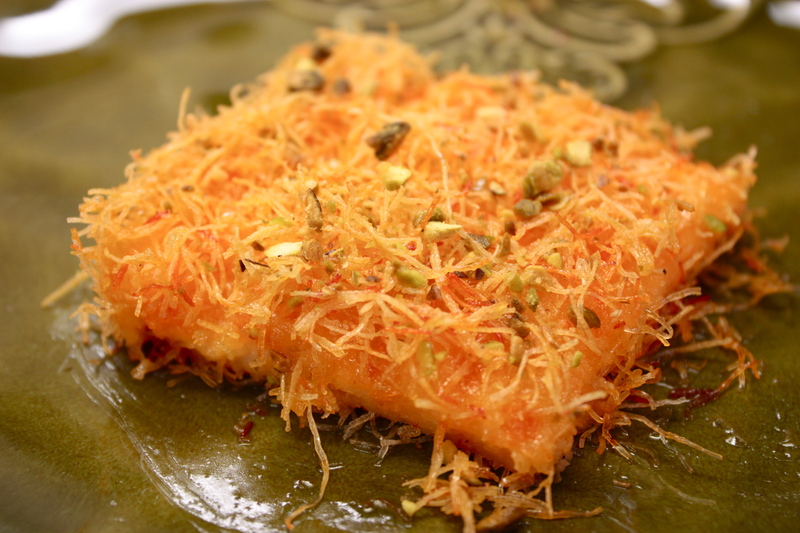 Konafa is composed of two layers of buttery shredded fillo dough (which can be found in Middle Eastern grocery stores, in the freezer section), with a cream layer in between. After baking, it is drizzled with a simple sugar syrup and topped with chopped nuts. It’s actually very simple and uses relatively few ingredients. But there’s something about the sweet, buttery, lightly floral flavor that is just so right, especially when it’s fresh from the oven. Even though I was full from all the food at that dinner party, I took a second serving of Konafa, so thrilled was I to finally be relishing it! I finally made Konafa at home. It turned out spectacular; it’s a surprising dessert that feels at once light and decadent. It tastes special, and I am so pleased. Cut fillo strands into smaller pieces (2-3 inches long) with a knife, then work the strands with fingers in a large bowl to separate. Melt butter then add the food color powder and mix to incorporate. Pour the butter gradually over the fillo strands, working to coat the strands evenly with butter. Press half of buttered fillo mixture into the bottom of a large baking pan (15 1/2 x 10 1/2 x 1 inch). Save the other half for the top. Heat the heavy cream in a saucepan over medium heat, stirring to avoid lumps. Add the orange blossom water and stir. In a separate small bowl, mix the cornstarch with the cold milk then add it to the cream on the stove. Cook over medium heat, stirring, until thickened (thick enough to coat the back of a spoon)–5-7 minutes. Remove from heat and cool to room temperature. For the simple syrup, stir the sugar into the water in a saucepan, and cook (don’t boil) until the syrup is clear and thick enough to coat the back of a spoon (it’s done when you touch the spoon and it feels slightly sticky). Remove from heat and let cool. This will be drizzled on top of the Konafa after baking. 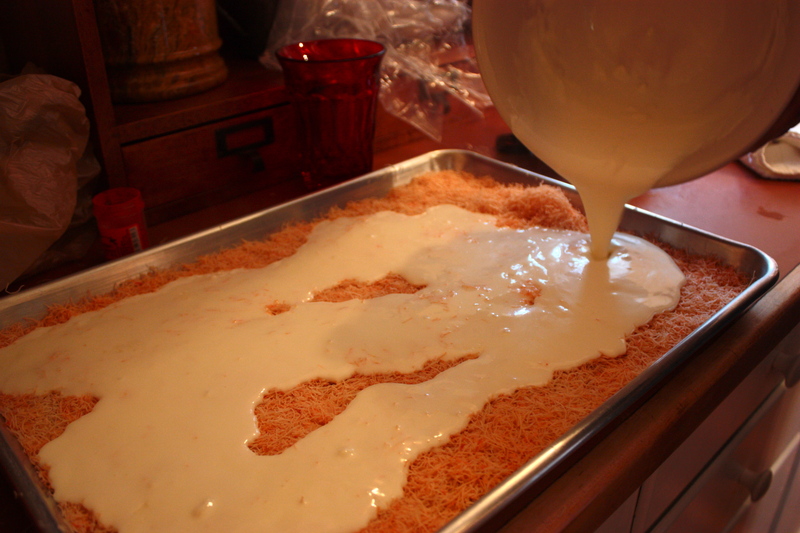 Pour the cream mixture over the base layer of fillo, smoothing it to evenly cover. Press the remaining half of buttered fillo over the cream mixture. Bake @ 350 degrees F 25-35 minutes, until top is crisp and beginning to brown slightly. Remove from oven and drizzle evenly with about 3/4 of the prepared sugar syrup (I think this is plenty of sweetness–add the syrup to your tastes, but it is the only sugar in the dessert. You can reserve the rest for drinks! 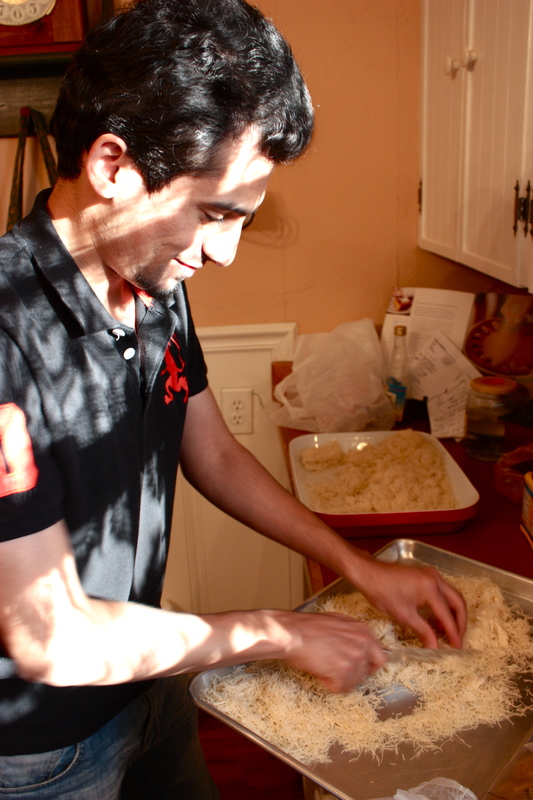 ), then sprinkle chopped nuts atop. Cut into squares and serve warm or room temperature. 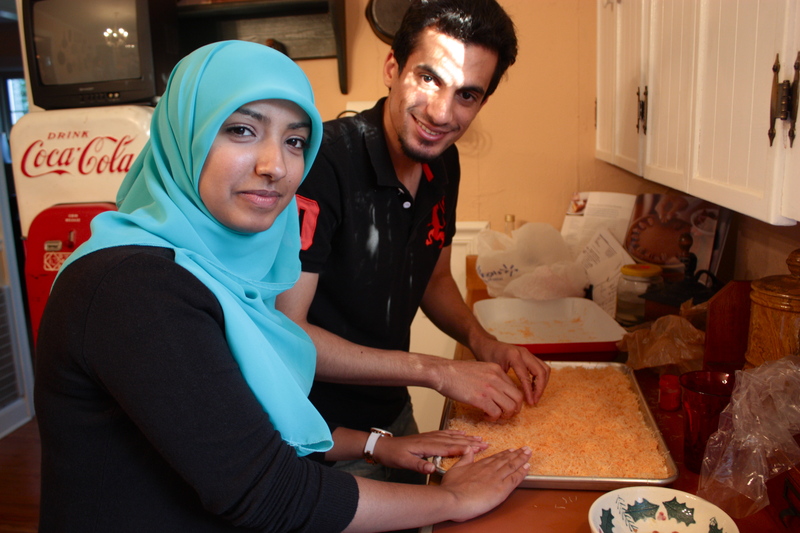 *Konafa recipes vary, but this is the way my friends made it. It is scrumptious! Rosewater can be substituted for the Orange Blossom. In other recipes I’ve seen, this is added to the sugar syrup instead of the cream mixture. Nearly any nuts or dried fruit could be used for the garnish. **The food color powder is added simply to color the fillo mixture in order to contrast the white cream layer. It is completely optional. I found powdered food color at a Middle Eastern grocery. 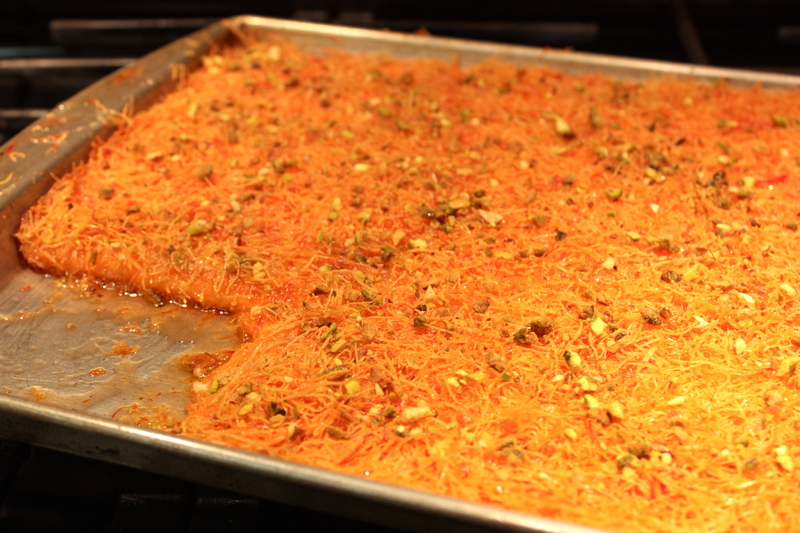 This entry was posted in Sweet and tagged arabic dessert, Cooking, culture, food, konafa, recipe by needtotaste. Bookmark the permalink. This looks amazing and I’m glad the ingredients aren’t as exotic as I imagined. I can see why this goes so fast. Wonderful dessert!!!!!!! 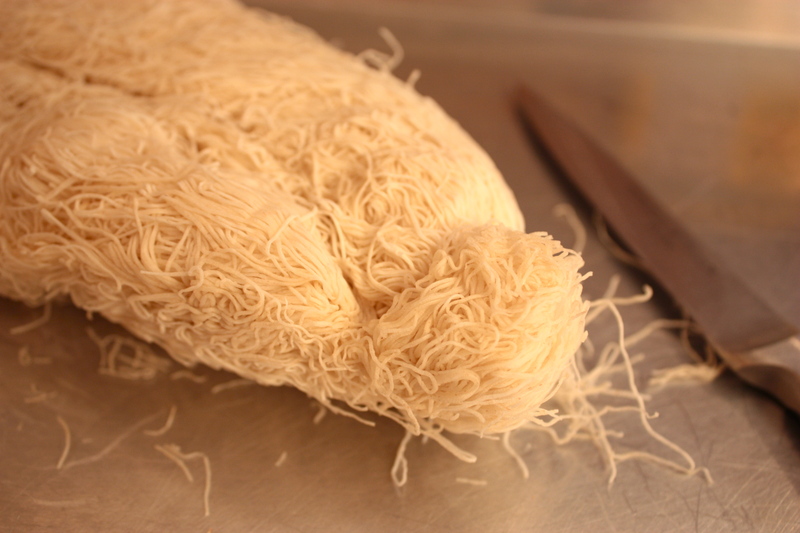 The shredded filo dough toasts and gives a wonderful texture to a rich but not rich-tasting dessert. One of the best desserts Allison has made. Your vivid description of tasting the dessert and then the photos really make me want to try this recipe. I’m glad–do try it, it’s so nice! Well this batch is already gone! My family loved it (though I probably ate most of it 🙂 )—we’ll have to get together and make it sometime! Thanks again for giving me that package of pastry!! What a wonderful post! I love the photos — not just of the food but of the convivial making of it. I wonder how blood oranges would work to add color…. Hmm the blood orange is a neat idea–the flavor would certainly be nice–not sure about the texture with the extra juiciness though. Do let me know if you try it! This looks and sounds breathtakingly delicious! And not horribly hard to make (especially, I suppose, if you have such wonderful co-chefs!!). I am definitely keeping this recipe on hand to try soon. Thank you! It’s such a nice flavor/texture combo, and it seems exotic, even though most of the ingredients are not. Beware–you will crave this dessert after you eat it once! Oh, my word. This looks wonderful. And I love the sound of the International Festival–table after table offering different foods from different countries and cultures. That must have been heavenly.